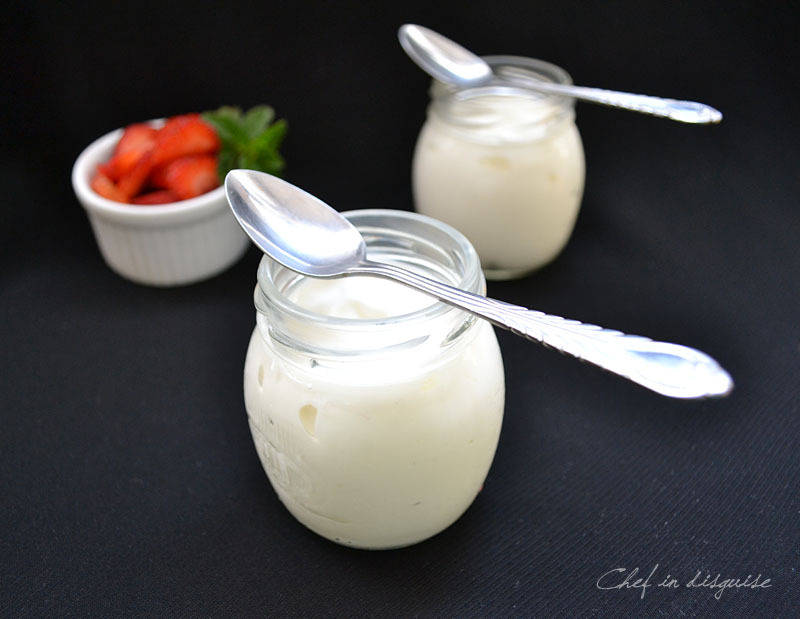 gurt Making your own homemade yogurt is a great way to have a treat that is free of preservatives, chemicals and artificial flavors. It is easy. Tastes a lot better than anything you can buy in a store and it is cheaper too. Having home-made yogurt on hand gives you a world of possibilities. You can have it for breakfast or a snack plain ,with some honey, fruits or granola. You can use it to make tzatziki, or mutawam. You can also cook with it. If all that is not tempting enough you can turn home-made yogurt into labaneh ( A great middle eastern appetizer which you can serve as a dip or a spread for sandwiches or even in salads). Ready to make your own yogurt? Making yogurt is a very simple process, requiring very little active working time. However the amount of information you would have to read about making your own yogurt can be over whelming. I tried my best to sum it up and summarize it for you but if you still have any questions please don’t hesitate to ask. To make yogurt you need active yogurt making bacteria and the easiest way to get it is to use some yogurt as a starter to transforming your milk into yogurt. If you have previously made your own yogurt save a little of each batch to make the next one. If you have never made your own yogurt you can start by using store-bought yogurt. There are two major points to keep in mind when it comes to starters. Fresh starter vs old starter: Using a fresh starter will give you mild tasting yogurt. Using an older yogurt for your starter will give you a final result that has a more prominent sour note . If I am using store bought yogurt for my starter I usually leave it outside the fridge the night before I am making yogurt to allow cultures to develop and use it the next day. Can I use flavored yogurt for a starter? Yes, using flavored yogurt as a starter will give very faint flavor to your homemade milk. For milk to turn into yogurt after adding the starter you need to keep it covered in a warm place. I usually pour the milk into a pot, cover it with the lid then cover that with a blanket. How long you keep your milk incubated will affect the consistency and how sour your yogurt will turn out. The longer you keep the milk you have mixed with the starter incubated in a warm place the thicker the consistency and more sour the taste of your yogurt will be. I usually check on it after 4 hours and decide if it needs more time. The incubation period is greatly affected by how cold or hot the weather is. On cold days you may need up yo 10-12 hour for the milk to turn into yogurt. While on hot days it can be as short as a couple of hours. Greek yogurt is basically yogurt that has been strained extensively to remove much of the liquid whey, along with the whey, straining removes a lot of the lactose, and sugar, giving it its thick creamy consistency. I prefer my yogurt thick and creamy so I strain it but the choice between greek and regular is entirely up to you. the recipe is the same and so are the steps up to straining the yogurt. If you don’t have a thermometer you can still make yogurt, heat the milk until it feels warm to the touch. Cover the pot with the lid and them put it in a warm place and cover it with a blanket or a couple of blankets if it is a really cold day. If you don’t have time you can bring the four corners of the cheese cloth together after pouring in the yogurt and lift it. Then twist the corners to squeeze out the liquid (it will drain through the cloth) over the bowl or sink. 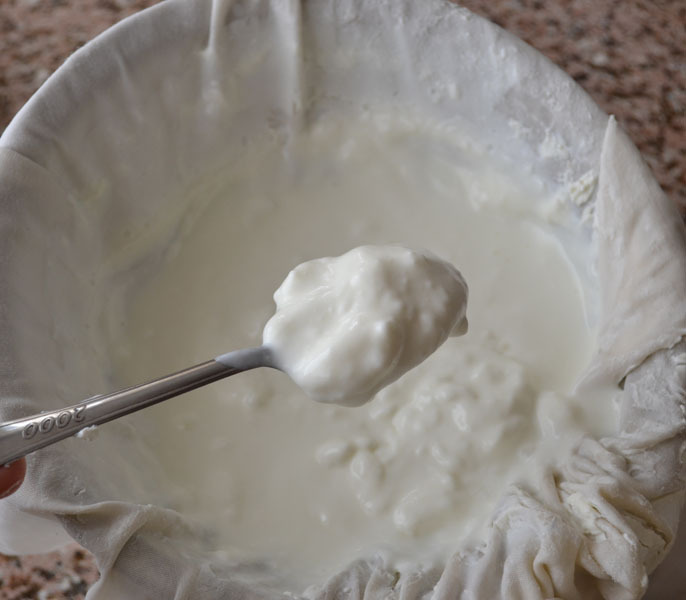 Continue squeezing, putting the yogurt under pressure, to force the liquid out till the majority of the surface liquid has been drained, it will start to drip more slowly. Tie off the top of the cloth just above the mass of yogurt with string. 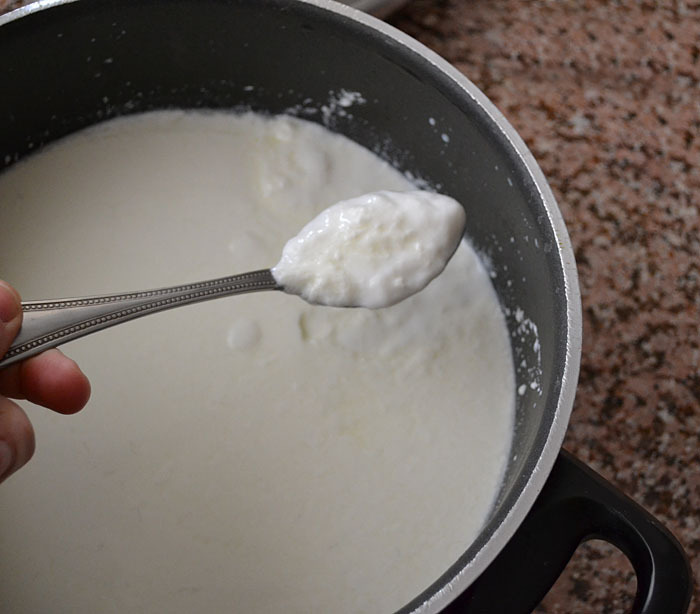 Place the cloth containing the yogurt in a strainer , and place it in a bowl where it doesn’t touch the bottom (that way the liquid can continue to drain).Place the bowl containing the strainer in the refrigerator and allow to drain for 2-3 hours. you didn’t allow the yogurt enough incubation time. My yogurt seems to have set but there’s a little clear liquid floating on the top and the sides. Is this okay? what do I do with the whey? Stay tuned for a couple of great recipes to use it up. Posted in Cheese and dairy, How to and tagged artificial flavors, black goat, breakfast, can I make yogurt with almond milk, can I make yogurt with soy milk, can I use flavored yogurt as a starter, food, homemade yogurt, how to, laban, recipe, starter, step by step, white goat, yogurt trouble shoot, عمل اللبن في المنزل. Bookmark the permalink. This is so neat I really want to try this. I wonder if you or any of your readers know of specific brands that have the live cultures? I like the White Mountain brand of yogurt. I live in Texas and can find it at Whole Foods. Surprisingly enough, I think most plain yogurts do. I tired one time using even a more processed, flavored, fat-free, artificially-sweetened variety, and it still worked. If I ever need to start a new batch, I typically go for Western Family probiotic, but have used Safeway brand greek yogurt, and I think I have used Astro. If you read the label/ingredient list on the tub, it should say. http://aboutyogurt.com/index.asp?bid=54 according to this page it appears most on the shelf have live cultures. This is a list by the Live & Active Culture Seal Program Participants. Thank you Manu, I am really glad you like it and you are so right. There is no comparison between store bought and homemade yogurt. I’m on board with the cheaper. We love this stuff, but it’s on the pricey side. Great tutorial. Thank you for the very clear yogurt making instructions. You took the mystery out and make it very doable. Great article Sawsan, you did an awesome job as usual. I like to make my own yogurt too, But I recently learnt some tricks for making it, especially in winter times. 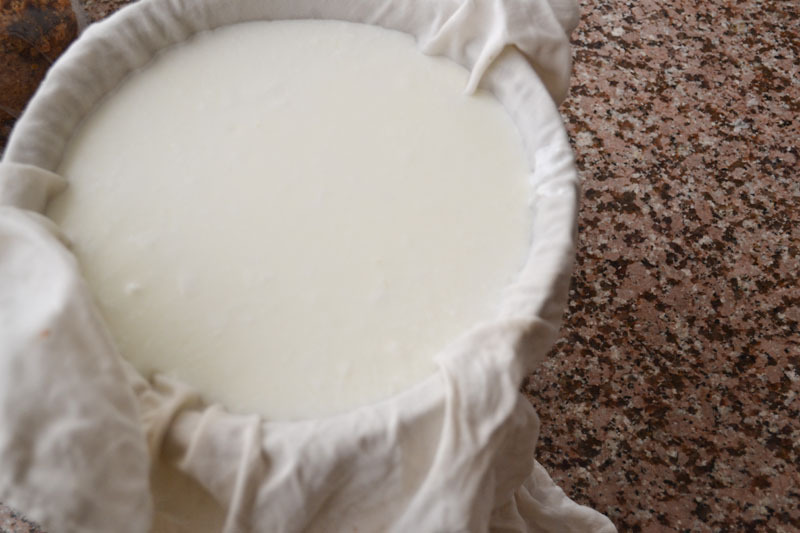 I pour some warm water inside a cooler and incupate the milk with the starter inside after covering it, that way will keep the milk warm and make perfect yogurt. I have a recipe of cheese waiting, may be will have the energy now to post it after I saw your’s, haha. This looks a bit complicated but really worth it!! Wow, this is such an informative and wonderful post Sawsan! You really did a nice job with this and I am excited to try this out! Great instructional post! I eat yogurt every day but have never made it. I’m sure homemade yogurt taste better and is better for you. I’ll just have to try it some day. Your instructions are great, so thanks for taking the time to provide them. Your yogurt looks delicious! Thanks for this tutorial! i recently tried making yogurt and it turned out well. The site I used suggested to add milk powder which I think altered the taste. They said it would make it creamier but next time I will leave it out. I can’t thank you enough for this recipe. My bff is obsessed and I am sending it to her now. She will freak! Great how-to guide Sawsan – my wife’s made yogurt a few times, though never specifically greek yogurt, which I love! I guess it depends on the type of milk used and so forth in order to get the wonderful creaminess of greek yogurt! I always do it by the way>>home made labaneh is the best! Sawsan, thanks for summing up all the information on making yogurt. Now that you’ve presented it this way, it all looks so easy! Will have to try it soon! Sawsan thank you i will try it tom. can this last for 4 days ? Awesome! Thanks for the useful instructions! I would love to get into making my own yogurts and cheese! We had the most incredible home made yogurt in Morocco for breakfast every day. I love it that you need not buy a fancy machine…and your yogurt looks gorgeous. I think I will try to make this on the weekend. Thanks Sawsan! Hubs tried making yogurt last month using a crockpot of all things! It turned out great, though he went for regular not Greek. The flavor is so good! It is really easy Kay and what you say is very true, home made is a much better than store bought. My husband and I eat so much yogurt. I bet it would save us some money to make our own! Your steps made it east to understand! Sawsan, a great tutorial on the ease (& benefits) of preparing our own yogurt. I make mine only slightly differently (adding powdered milk as well), but strain it like you. Great post, and lovely photos! Powdered milk is added to thicken yogurt and reduce the amount lost as whey.The powdered milk available here is cow’s milk only and I usually make yogurt from goat’s milk, I like the taste and consistency. I avoid adding the powdered milk for two reasons: it will change the flavor and I worry about the source of the milk that was made into powder. Thanks Sawsan! Makes total sense! I have powdered goat’s milk – but of course, as you say, I don’t know the source. The website looks great, I like the new header! Making yogurt seems way easier than I thought it would be! I am bound and determined to try this Sawsan. You make homemade yogurt sound and look so lucsious. Your photos are stunning as always and I so appreciate the very detailed directions. I need that! Also loved the trouble shooting…read every word and once Easter has passed, I will give this a go. Hi Sawsan! When you teach something, you are always very thorough! Very well-written post on homemade Greek yogurt and I’m keeping this for reference. I know I want to make it one day! Homemade must be the best!!! Very nice n informative post, yogurt looks so yummy. Love the recipe, can’t wait to try it! I do have to point out though, that 1 litre = 4 cups, not 5, so I’m a little confused about how much milk you’re supposed to use. Fabulous post – so informative and detailed! I love yogurt and I’ve never made yogurt before but you’ve provided such a good post, I’m very much excited to try it out! not only have I wondered how to make yogurt I wanted to make it.. Thank you so much…I am so glad I found your Blog! Thank you very much for taking the time to explore my blog. No, if it is too watery, make sure it is in a warm place, you may want to cover it with a little blanket and leave it for a couple of hours more. Thank you so much. Will also try to make my own cheese! Can I use greek yogurt as a starter? What an awesome and informative post! 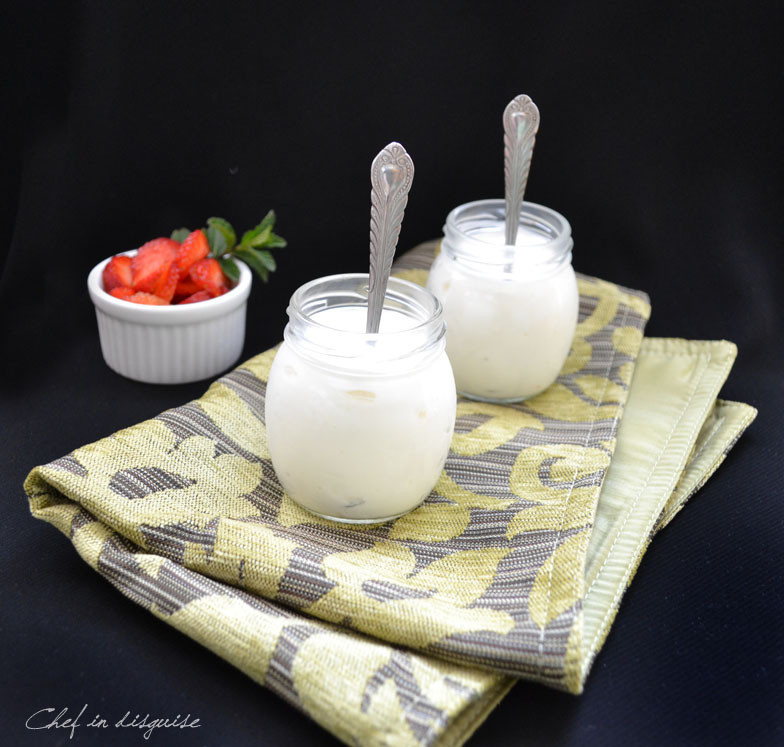 I have been wanting to make my own yogurt for a while now… I will definitely bookmark your instructions, as they are the clearest and most helpful that I have read; thank you! Thanks for the post! I just finished my first attempt, but I think I put the yogurt into the fridge before it had thickened enough. It all strained through the cheese cloth with no solids left! Can I reheat it and let it incubate more? I’d hate to have to throw the whole batch out. Thanks! What type of milk did you use?How much milk did you use? what type of starter did you use? You can heat your oven to 200 for 10 minutes and then turn it off. Place the yogurt in a heat proof bowl, add 2 more tablespoons starter, stir them well and cover the bowl and place it in the oven and close the oven. Leave it there for 5-6 hours. It should thicken if you are sure your starter has live cultures. I’ve been making yogurt for a while now, but your post is still very useful. Now I know how to fix the runny-ness! 🙂 Thank you! Hi- I stumbled upon this site serendipitously whilst researching how to make my own yoghurt ! I was having a lot problems, but now…. with your very concise instructions, I too have a smile on my face! many thanks & keep up the good work ! Hi Sawsan! I just found your blog while researching how to make homemade yogurt using store-bought yogurt as a starter. This page is very informative. I have a few questions though… would this work using almond or soy milk or does it have to be dairy? And could someone use a flavored store-bought yogurt with live cultures as a starter, or does it need to be plain? I would like to try making my own yogurt to see if it turns out to be cheaper than always buying it from the store. Alright! So here I am again coming to report my results of much experimentation in the world of yogurt making! It has been so fun, and I still have so many more things to try/play around with! In learning how to make yogurt I have come across numerous methods and recipes, so have taken it into my own hands to try all different ways and recipes to find which works best for me! So far I have tried using Soy, Almond, and skim dairy milks. The soy actually works! The almond was just something terrible, and the dairy was my favorite! I have tried the heating milk to 180 deg. then letting it cool to 110, and also just heating to 110. I tried using both flavored and plain yogurt as my starters and both work! (Even one that doesn’t specify that it contains live cultures on the front of the package (Silouhettes peach flavor – the ingredients list does say active bacterial cultures, but I’ve heard people say that you can’t be sure unless it says so on the front of the package) and it worked!! (Using the flavored starter imparts a very slight hint of the flavor used into your new made yogurt. I have used different incubation methods to keep my yogurt warm (I live in BC, Canada where it is almost always very cold) including a dish-towel lined warmed crock-pot/slow cooker, an electric heating pad, and a stainless-steel thermos. All have worked, but I think I like the heating pad the best (I lucked out, the low setting on mine keeps the yogurt at exactly 110 degrees!) I actually haven’t tasted the thermos-incubated yogurt yet as I just made it yesterday, so I will be trying it today. It did set nicely – I peeked this morning, so it will be a matter of taste now…. which is what I wonder about, as I typically can’t stand the taste of water/drinks in stainless-steel water bottles! We’ll see… it was only a 1 cup batch, so won’t be too terrible if it is no good. All just learning! Nikki I really can’t thank you enough for sharing the results of your experiments with us. With your permission, I would like to update the post with your findings. Is that ok? These are valuable information and I think many will find them helpful. I updated the post with your valuable info Nikki, thank you again for sharing it. I live on a sailboat, my husband and our 4 grown children are in Mexico, heading into the Sea of Cortez. I stumbled on this site. I can’t wait to try this…..
One question, does the taste change if you use whole, fat free milk? can I use lactaid kind of milk? Where did I go wrong ? Just made my first batch of this last night & was really impressed with the results … last night. I decided to let the yogurt sit in the fridge inside a strainer and allow excess liquid to drip into a bowl overnight. This morning I have what is basically paste that tastes like sour cream. Should I not have done that ? You made Labneh, which is a yogurt cheese made by straining yogurt for a long time, It does indeed taste like sour cream. What happened is that the over night stay in the fridge was too long. A couple of hours would have been enough. You’re kidding ; I made an edible byproduct by accident ? That’s too funny. Alrighty then it’s time to make some yogurt. Love this.thank you for.sharing. I ended up making labneh when I finally Got everything to work. I guess putting it in the oven all night on litter seeing can do that. In will have another go at it soon. It’s very cold I here in Canada Pacific coast so will have to try the.blankets. My room is the warmest place to put it. Well second attempt did not work. I think I need to invest in a thermometer for this. And not use cold starter. The Labneh turned out yummy I liked it. My family not so much, but I put it in my lasagne and they all devoured it. I think I may be cooking it too long or hot cuz it looks like hard curds when I go to let it sit. Hi Sawsan, thanks for sharing this recipe. I’m writing to you from Malaysia. It worked great for me and looked and tasted just like the store bought Greek yogurt. I just want to share my experience in case anyone experiences what I did. My first attempt failed. After 3 hours, I still had only milk in the pot. But I figured it was that I didn’t keep the pot warm enough or my starter was too cold. I had put the covered pot straight into the cold oven without a blanket and scooped the starter right out of the fridge. So I put a spoon out to warm to room temperature, reheated the milk, put the pot in a pan of warm water, covered with multiple kitchen towels and put all of it in the oven again. Two hours later, voila! I used pasteurized full cream milk. First of all, I love your blog! You have really great, easy to follow instructions. Now, my yogurt problem… A few nights ago I made yogurt and strained it. It came out really stringy. Not thin, but not thick and creamy like Greek yogurt. I used 2% milk because it was on sale. And 2% Greek yogurt to start it because they didn’t have whole at the store. I tried again tonight. Hopefully it works better this time. I was wondering what the difference is between black goats milk and white goats milk? Love the post! I’m a very visual person so the pictures are much appreciated (and beautiful)! My yoghurt has turned out stringy. Is this ok still? And can I still use the whey from stringy yoghurt as the whey is a little stringy also? This is probably due to the type of the starter you used. You can still use the yogurt and the whey but I would change the type of starter next time. Great info! I’m making my own yogurt, using Yogourmet starter with probiotics, 2% milk, 1/4c powdered skim milk. It’s nice and thick and tastes great. Gave some to my sister to try, she’s concerned that there’s not enough protein in the home-made version, versus her Greek store-bought yogurt. Can’t find any info on how much protein is in the home-made version. Does anyone have any info that I can give to her? Hi there, I’m new to your website and just wanted to say hi and thank you! I love how detailed your recipes are and that you also give tips/ideas how to correct mistakes. I already tried the Greek yogurt and seedy crackers recipe. Both turned out really well. I cannot wait to try your other recipes. 🙂 Thanks! some commercial types of yogurt are thickened with starch or other stuff and they contain very few live cultures. Thanks sawsan, it really hepful, but i want to use starter as tablets available from pharmaceutical instead liquid culture, is it possible. the tablets you refer to are used to make cheese, you can’t use them to make yogurt. I’m making my first batch right now. I’m so excited! I usually boil the milk and then allow it to cool to 40C then add the starter. As for the incubation, Immediately after mixing the starter place the pot in a place where it won’t be disturbed and cover it with a blanket, keeping the pot really warm is essential. Hi Sawsan, what a great blog you have. Ik tried your home made yoghurt for the first time yesterdag and it worked perfect. I have a question. If something goes wrong during this proces of making yoghurt, in what way do I recognise that. The smell being awfull or ??? If you start with good milk the problems you will face is that the yogurt will not set, it will remain in a liquid state or only the surface will turn to yogurt while the rest doesn’t. If that happens that means that either you did not incubate it long enough or the place you incubated it in was not warm enough. Greetings! I’ve been reading your weblog for a while now and finally got the bravery to go ahead and give you a shout out from Lubbock Texas! Just wanted to say keep up the good work! I’m going to try this! Thank you! I’ve been trying out your recipes and they are fantastic! Then can it be used for making yogurt? I’m only trying yogurt this time….thanks. Hey Sawsan, So, it’s been about 9 months since I started making yogurt at home, just thought I’d pop in to say thanks again for inspiring me to do so – I love it!! I always strain it now to make thick creamy greek yogurt! My favorite thing to use it for right now is to make a dip for apples by mixing it with cocoa powder and stevia or peanut flour and stevia…. or both cocoa powder AND peanut flour and stevia. It is SOOO good. Sometimes I just eat it like a pudding, but it is completely healthy!! Thank you so much for the comment Nikki. I just love the idea od coco powder and stevia with apples or perhaps orange wedges! I need to try that soon! No problem!! Let me know what you think if you try it!! Have just found your blog and love the sound of your greek yogurt but wondered is it possible to make using a vacuum flask? Love your post on yogurt, but wondered is it possible to make it in a vacuum flask to retain the heat? Offcto explore the rest of your site! Just found your post on yogurt and wondered is it possible to make using a vacuum flask ? Thank you for such a straight forward and well written post. I am glad I found your blog. This appears to be simple enough for me to try. Can I use 1 percent milk? Is there a difference in the yogurt using 1, 2 percent or whole milk? I read through your instruction for making yogurt and many of the responses as well. I am intrigued and will give it a try! Can you tell me what type of milk works best? I mean whole, 2%, 1% or skim. Does the fat content of the milk change the outcome in the finished product? You can make yogurt with any type of milk but the higher the fat content in the milk, the richer the flavor of the resulting yogurt. Hi, we like very firm Greek yogurt so to 1 litre of milk I add 4 heaped tablespoons of milk powder and whisk it into the milk as it heats. I make the yogurt in a large Kilner jar but don’t fasten the lid down, to allow evaporation of some of the moisture (though the jar is covered with a cloth). The result is a very firm yogurt (you can almost scoop it out as if it were ice cream) and there is only ever a very little whey. It never needs to be strained. I know this won’t suit everyone, but we love it. I’ve been making greek yogurt for quite a few years now. I didn’t have any success though until I stumbled on a recipe that suggested letting the yogurt develop in a bath of warm water. Before that I couldn’t seem to keep it warm enough with blankets or towels or wrapped in a warm towel and put in the microwave (just because it was draft free). So, when I’ve put the prepared yogurt in the jars to develop I put them in a stock pot filled with water at about 48 C (with room for displacement once the jars are added) and let it sit between 4 and 8 hours. If it’s very cold (I live in Canada) I might warm the water a bit during the process but keeping a close eye on it so it just warms up, if necessary. As I leave the pot on the back of the stove unless I really need it during the curing process, it’s easy to warm up. Also, I use muslin to strain the yogurt. I bought it at the fabric store and cut it to fit my colander. It washes very well and is so much easier to manage than cheesecloth as the weave is tight. I love your site and discovered it because I was looking for information about labneh. I’ll be turning some of my next batch of yogurt into labneh. Thanks for this – I love Middle Eastern food and will try lots of your recipes. 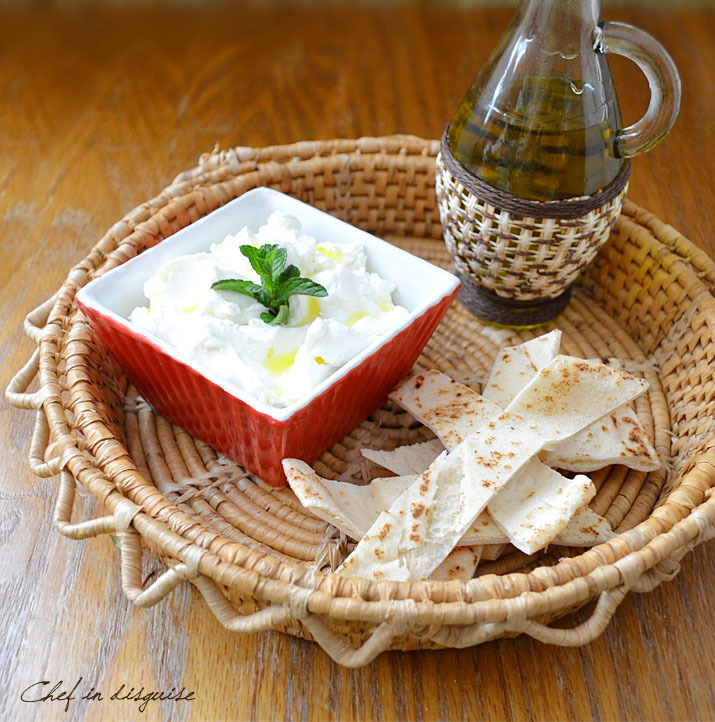 I do hope that you’ll enjoy the labneh and any other Middle Eastern recipes that you try from my blog. Hello fellow yogurt making Canadian!! A suggestion for something else that keeps the yogurt at the perfect temperature while it cultures…. a heating pad inside a blanket. just place the heating pad on low setting, place yogurt to be cultured on top and wrap all in a blanket!! Works like a charm and super easy/ no fuss with changing temperatures!! Thank you kindly for the wonderful tip! Hello back fellow yogurt making Canadian!! Thanks for the suggestion. Super! I supposed I could always just buy a yogurt maker but where’s the fun in that? I’ll give the heating pad a try.